Mustang III FX993 crashed in Limfjorden 17/5 1944. The aircraft belonged to RAF 65 Sqn Fighter Command and was coded YT-?. T/O 09:00 Coltishall. OP: Day Ranger to Denmark. Early in the morning 65 Sqn flew from Funtington to Coltishall to refuel before the Day Ranger to Denmark. At 09:00 eight Mustangs left Coltishall and headed for Aalborg. The Danish coastline was crossed by Lild Strand and the eight Mustangs divided into two groups and attacked the two Aalborg airfields. F/lt Richard Barrett attacked and damaged a He 177A-5 which was on a test flight after repair. The He 177 immediately returned to Fliegerhorst Aalborg Ost where it landed with Barrett firing at it from across the Limfjord. At the same time Unteroffizier Siegfried Rudchinat of 10./JG 11 took off in his Bf 109 and still during take off caught Barret in his sight and fired his guns. Barrett was hit and crashed at 11:47 hours into the Limfjorden. 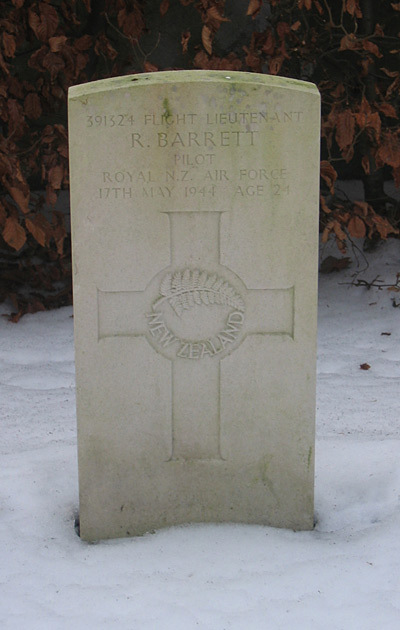 F/Lt Richard Barrett was laid to rest in Frederikshavn cemetery on 24/5 1944. Sources: LBUK, BF, FK, AIR 28/169., Letter from Robert Spreckels dated 6/5-68, RL 2 III/818+848, TW.